For other uses, see Thelonious (disambiguation) and Thelonious Sphere Monk (disambiguation). 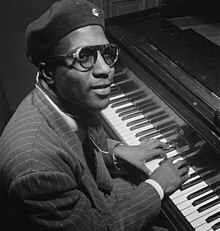 Thelonious Sphere Monk (/θəˈloʊniəs/, October 10, 1917 – February 17, 1982) was an American jazz pianist and composer. He had a unique improvisational style and made numerous contributions to the standard jazz repertoire, including "'Round Midnight", "Blue Monk", "Straight, No Chaser", "Ruby, My Dear", "In Walked Bud", and "Well, You Needn't". Monk is the second-most-recorded jazz composer after Duke Ellington, which is particularly remarkable as Ellington composed more than a thousand pieces, whereas Monk wrote about 70. Monk's compositions and improvisations feature dissonances and angular melodic twists and are consistent with his unorthodox approach to the piano, which combined a highly percussive attack with abrupt, dramatic use of switched key releases, silences, and hesitations. His style was not universally appreciated; the poet and jazz critic Philip Larkin dismissed him as "the elephant on the keyboard". Monk was renowned for a distinct look which included suits, hats, and sunglasses. 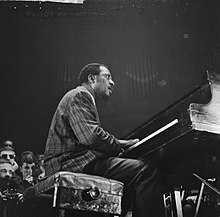 He was also noted for an idiosyncratic habit during performances: while other musicians continued playing, Monk stopped, stood up, and danced for a few moments before returning to the piano. Monk is one of five jazz musicians to have been featured on the cover of Time magazine (the others being Louis Armstrong, Dave Brubeck, Duke Ellington and Wynton Marsalis). 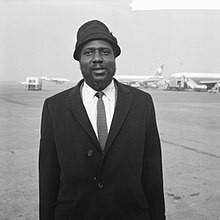 Thelonious Sphere Monk was born two years after his sister Marion on October 10, 1917, in Rocky Mount, North Carolina, and was the son of Thelonious and Barbara Monk. His badly written birth certificate misspelled his first name as "Thelious" or "Thelius". It also did not list his middle name, taken from his maternal grandfather, Sphere Batts. A brother, Thomas, was born in January 1920. In 1922, the family moved to the Phipps Houses, 243 West 63rd Street, in Manhattan, New York City; the neighborhood was known as San Juan Hill because of the many African-American veterans of the Spanish–American War who lived there (urban renewal displaced the long-time residents of the community, who saw their neighborhood replaced by the Amsterdam Housing Projects and Lincoln Center for the Performing Arts, though the Phipps Houses remained). Monk started playing the piano at the age of six and was largely self-taught. He attended Stuyvesant High School, a public school for gifted students, but did not graduate. At 17, Monk toured with an evangelist, playing the church organ, and in his late teens he began to find work playing jazz. In the early to mid-1940s, he was the house pianist at Minton's Playhouse, a Manhattan nightclub. Much of Monk's style (in the Harlem stride tradition) was developed during his time at Minton's, when he participated in after-hours cutting contests, which featured many leading jazz soloists of the time. Monk's musical work at Minton's was crucial in the formulation of bebop, which would be furthered by other artists, including Dizzy Gillespie, Charlie Christian, Kenny Clarke, Charlie Parker, and, later, Miles Davis. Monk is believed to be the pianist featured on recordings Jerry Newman made around 1941 at the club. Monk's style at this time was later described as "hard-swinging," with the addition of runs in the style of Art Tatum. Monk's stated influences included Duke Ellington, James P. Johnson, and other early stride pianists. According to the documentary Thelonious Monk: Straight, No Chaser, Monk lived in the same neighborhood in New York City as Johnson and knew him as a teenager. Mary Lou Williams, who mentored Monk and his contemporaries, spoke of Monk's rich inventiveness in this period, and how such invention was vital for musicians, since at the time it was common for fellow musicians to incorporate overheard musical ideas into their own works without giving due credit. "So, the boppers worked out a music that was hard to steal. I'll say this for the 'leeches,' though: they tried. I've seen them in Minton's busily writing on their shirt cuffs or scribbling on the tablecloth. And even our own guys, I'm afraid, did not give Monk the credit he had coming. Why, they even stole his idea of the beret and bop glasses." In 1944 Monk made his first studio recordings with the Coleman Hawkins Quartet. Hawkins was one of the earliest established jazz musicians to promote Monk, and the pianist later returned the favor by inviting Hawkins to join him on a 1957 session with John Coltrane. In 1947, Ike Quebec introduced Monk to Lorraine Gordon and her first husband, Alfred Lion, the founder of Blue Note Records. From then on, Gordon preached his genius to the jazz world with unrelenting passion. Shortly after meeting Gordon and Lion, Monk made his first recordings as the Coleman Hawkins Quartet leader for Blue Note (later anthologized on Genius of Modern Music, Vol. 1), which showcased his talents as a composer of original melodies for improvisation. Monk married Nellie Smith the same year, and on December 27, 1949 the couple had a son, T. S. Monk (called Toot), who became a jazz drummer. A daughter, Barbara (affectionately known as Boo-Boo), was born on September 5, 1953 and died of cancer in 1984. In her autobiography, Gordon spoke of the utter lack of interest in Monk's recordings, which translated to poor sales. "I went to Harlem and those record stores didn't want Monk or me. I'll never forget one particular owner, I can still see him and his store on Seventh Avenue and 125th Street. 'He can't play lady, what are you doing up here? The guy has two left hands.' 'You just wait,' I'd say. 'This man's a genius, you don't know anything.'" Due to Monk's reticence, Gordon became his mouthpiece to the public. In February 1948, she wrote to Ralph Ingersoll, the editor of the newspaper PM, and described Monk as "a genius living here in the heart of New York, whom nobody knows". As a result, one of PM's best writers visited Monk to do a feature on him, but Monk wouldn't speak to the reporter unless Gordon was in the room with him. In September of the same year, Lorraine approached Max Gordon, the owner and founder of the Village Vanguard jazz club, and secured Monk his first gig there. Monk was showcased at the club for a week, but not a single person came. In August 1951, New York City police searched a parked car occupied by Monk and his friend Bud Powell. They found narcotics in the car, presumed to have belonged to Powell. Monk refused to testify against his friend, so the police confiscated his New York City Cabaret Card. Without this, Monk was unable to play in any New York venue where liquor was served, and this severely restricted his ability to perform for several years. Monk spent most of the early and mid-1950s composing, recording at Blue Note, and performing at theaters and out-of-town gigs. After intermittent recording sessions for Blue Note from 1947 to 1952, Monk was under contract to Prestige Records for the following two years. With Prestige, he cut several highly significant, but at the time under-recognized, albums, including collaborations with the saxophonist Sonny Rollins and the drummers Art Blakey and Max Roach. In 1954, Monk participated in a Christmas Eve session, which produced most of the albums Bags' Groove and Miles Davis and the Modern Jazz Giants by Davis. In his autobiography, Miles, Davis claimed that the alleged anger and tension between them did not take place and that the claims of blows being exchanged were "rumors" and a "misunderstanding". In 1954, Monk paid his first visit to Paris. As well as performing at concerts, he recorded a solo piano session for French radio (later issued as an album by Disques Vogue). Backstage, Mary Lou Williams introduced him to Baroness Pannonica "Nica" de Koenigswarter, a member of the Rothschild family and a patroness of several New York City jazz musicians. She was a close friend for the rest of Monk's life, including taking responsibility for him when she and Monk were charged with marijuana possession. By the time of his signing to Riverside, Monk was highly regarded by his peers and by some critics, but his records remained poor sellers and his music was still regarded as too "difficult" for more mainstream acceptance. Indeed, with Monk's consent, Riverside had managed to buy out his previous Prestige contract for a mere $108.24. He willingly recorded two albums of jazz standards as a means of increasing his profile: Thelonious Monk Plays Duke Ellington (1955) and The Unique Thelonious Monk (1956). On Brilliant Corners, recorded in late 1956, Monk mainly performed his own music. The complex title track, which featured Rollins, was so difficult to play that the final version had to be edited together from multiple takes. The album, however, was largely regarded as the first success for Monk. After having his cabaret card restored, Monk relaunched his New York career with a landmark six-month residency at the Five Spot Cafe in the East Village neighborhood of New York beginning in June 1957, leading a quartet with John Coltrane on tenor saxophone, Wilbur Ware on bass, and Shadow Wilson on drums. Little of this group's music was documented owing to contractual problems: Coltrane was signed to Prestige at the time, but Monk refused to return to his former label. One studio session by the quartet was made for Riverside, three tunes which were not released until 1961 by the subsidiary label Jazzland along with outtakes from a larger group recording with Coltrane and Hawkins, those results appearing in 1957 as the album Monk's Music. An amateur tape from the Five Spot (a later September 1958 reunion with Coltrane sitting in for Johnny Griffin) was issued on Blue Note in 1993; and a recording of the quartet performing at a Carnegie Hall concert on November 29 was recorded in high fidelity by Voice of America engineers, rediscovered in the collection of the Library of Congress in 2005 and released by Blue Note. "Crepuscule with Nellie," recorded in 1957, "was Monk's only, what's called through-composed composition, meaning that there is no improvising. It is Monk's concerto, if you will, and in some ways it speaks for itself. But he wrote it very, very carefully and very deliberately and really struggled to make it sound the way it sounds. [... I]t was his love song for Nellie," said the author of the "definitive Monk biography," Robin Kelley. The Five Spot residency ended Christmas 1957; Coltrane left to rejoin Davis's group, and the band was effectively disbanded. Monk did not form another long-term band until June 1958 when he began a second residency at the Five Spot, again with a quartet, this time with Griffin (and later Charlie Rouse) on tenor, Ahmed Abdul-Malik on bass, and Roy Haynes on drums. On October 15, 1958, en route to a week-long engagement for the quartet at the Comedy Club in Baltimore, Maryland, Monk and de Koenigswarter were detained by police in Wilmington, Delaware. When Monk refused to answer the policemen's questions or cooperate with them, they beat him with a blackjack. Though the police were authorized to search the vehicle and found narcotics in suitcases held in the trunk of the Baroness's car, Judge Christie of the Delaware Superior Court ruled that the unlawful detention of the pair, and the beating of Monk, rendered the consent to the search void as given under duress. After extended negotiations, Monk signed in 1962 with Columbia Records, one of the big four American record labels of the day. Monk's relationship with Riverside had soured over disagreements concerning royalty payments and had concluded with a brace of European live albums; he had not recorded a studio album since 5 by Monk by 5 in June 1959. Working with producer Teo Macero on his debut for Columbia, the sessions in the first week of November had a lineup that had been with him for two years: tenor saxophonist Rouse (who worked with Monk from 1959 to 1970), bassist John Ore, and drummer Frankie Dunlop. Monk's Dream, his first Columbia album, was released in 1963. Columbia's resources allowed Monk to be promoted more heavily than earlier in his career. Monk's Dream became the best-selling LP of his lifetime, and on February 28, 1964, he appeared on the cover of Time magazine, being featured in the article "The Loneliest Monk". The cover article was originally supposed to run in November 1963, but it was postponed due to the assassination of President John F. Kennedy. 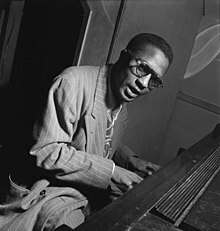 According to biographer Kelley, the 1964 Time appearance came because "Barry Farrell, who wrote the cover story, wanted to write about a jazz musician and almost by default Monk was chosen, because they thought Ray Charles and Miles Davis were too controversial. ... [Monk] wasn't so political. ...[O]f course, I challenge that [in the biography]," Kelley wrote. 4 time piece, "Ugly Beauty". As had been the case with Riverside, his period with Columbia contains many live albums, including Miles and Monk at Newport (1963), Live at the It Club, and Live at the Jazz Workshop, the latter two recorded in 1964, the last not being released until 1982. After the departure of Ore and Dunlop, the remainder of the rhythm section in Monk's quartet during the bulk of his Columbia period was Larry Gales on bass and Ben Riley on drums, both of whom joined in 1964. Along with Rouse, they remained with Monk for over four years, his longest-serving band. Monk had disappeared from the scene by the mid-1970s and made only a small number of appearances during the final decade of his life. His last studio recordings as a leader were made in November 1971 for the English Black Lion label, near the end of a worldwide tour with the Giants of Jazz, a group which included Gillespie, Kai Winding, Sonny Stitt, Al McKibbon, and Blakey. Bassist McKibbon, who had known Monk for over twenty years and played on his final tour in 1971, later said: "On that tour, Monk said about two words. I mean literally maybe two words. He didn't say 'Good morning,' 'Goodnight,' 'What time?' Nothing. Why, I don't know. He sent word back after the tour was over that the reason he couldn't communicate or play was that Art Blakey and I were so ugly." A different side of Monk is revealed in Lewis Porter's biography, John Coltrane: His Life and Music; Coltrane states: "Monk is exactly the opposite of Miles [Davis]: he talks about music all the time, and he wants so much for you to understand that if, by chance, you ask him something, he'll spend hours if necessary to explain it to you." Blakey reports that Monk was excellent at both chess and checkers. The documentary film Thelonious Monk: Straight, No Chaser (1988) attributes Monk's quirky behavior to mental illness. In the film, Monk's son says that his father sometimes did not recognize him, and he reports that Monk was hospitalized on several occasions owing to an unspecified mental illness that worsened in the late 1960s. No reports or diagnoses were ever publicized, but Monk would often become excited for two or three days, then pace for days after that, after which he would withdraw and stop speaking. Doctors recommended electroconvulsive therapy as a treatment option for Monk's illness, but his family would not allow it; antipsychotics and lithium were prescribed instead. Other theories abound: Leslie Gourse, author of the book Straight, No Chaser: The Life and Genius of Thelonious Monk (1997), reported that at least one of Monk's psychiatrists failed to find evidence of manic depression (bipolar disorder) or schizophrenia. Another doctor maintains that Monk was misdiagnosed and prescribed drugs during his hospital stay that may have caused brain damage. As his health declined, Monk's last six years were spent as a guest in the Weehawken, New Jersey, home of his long-standing patron and friend, Pannonica de Koenigswarter, who nursed Parker during his final illness. She proved to be a steadfast presence, as did his own wife Nellie, especially as his life descended into further isolation. Monk did not play the piano during this time, even though one was present in his room, and he spoke to few visitors. He died of a stroke on February 17, 1982, and was buried in Ferncliff Cemetery in Hartsdale, New York. "Monk's usual piano touch was harsh and percussive, even in ballads. He often attacked the keyboard anew for each note, rather than striving for any semblance of legato. Often seemingly unintentional seconds embellish his melodic lines, giving the effect of someone playing while wearing work gloves. [...] He hit the keys with fingers held flat rather than in a natural curve, and held his free fingers high above the keys. [...] Sometimes he hit a single key with more than one finger, and divided single-line melodies between the two hands." In contrast with this unorthodox approach to playing, he could play runs and arpeggios with great speed and accuracy. He also had good finger independence, allowing him to play a melodic line and a trill simultaneously in his right hand. Monk often used parts of whole tone scales, played either ascending or descending, and covering several octaves. He also had extended improvisations that featured parallel sixths (he also used these in the themes of some of his compositions). His solos also feature space and long notes. Unusually for a bebop-based pianist, as an accompanist and on solo performances he often employed a left-hand stride pattern. A further characteristic of his work as an accompanist was his tendency to stop playing, leaving a soloist with just bass and drums for support. Monk had a particular proclivity for the key of B flat. All of his many blues compositions, including "Blue Monk," "Misterioso," "Blues Five Spot," and "Functional," were composed in B flat; in addition, his signature theme, "Thelonious," largely consists of an insistently repeated B-flat tone. Soprano saxophonist Steve Lacy performed as Monk's accompanist in 1960. Monk's tunes became a permanent part of his repertoire in concert and on albums. Lacy recorded many albums entirely focused on Monk's compositions. Gunther Schuller wrote the work "Variants on a Theme of Thelonious Monk (Criss-Cross)" in 1960. It first appeared on Schuller's album Jazz Abstractions (1961) and was later performed and recorded by other artists, including Ornette Coleman, Eric Dolphy, and Bill Evans. Round Midnight Variations is a collection of variations on the song "'Round Midnight" premiered in 2002. Composers contributing included Milton Babbitt, William Bolcom, David Crumb. George Crumb, Michael Daugherty, John Harbison, Joel Hoffman, Aaron Jay Kernis, Gerald Levinson, Tobias Picker, Frederic Rzewski, Augusta Read Thomas, and Michael Torke. North Coast Brewing Company produces Brother Thelonious ale, the proceeds from which go towards jazz music education for young people. That's The Way I Feel Now: A Tribute To Thelonious Monk (1984), an album featuring different groupings of rock and jazz musicians on each song including Steve Lacy, Donald Fagen, Todd Rundgren, Peter Frampton, Carla Bley, Joe Jackson, Gil Evans and Was Not Was. e.s.t. Esbjörn Svensson Trio Plays Monk (1996), by e.s.t. Propensity (2009), by Monk Inc. In 1993, he was awarded the Grammy Lifetime Achievement Award. In 2006, he was awarded a special Pulitzer Prize for "a body of distinguished and innovative musical composition that has had a significant and enduring impact on the evolution of jazz". The Thelonious Monk Institute of Jazz was established in 1986 by the Monk family and Maria Fisher. Its mission is to offer public school-based jazz education programs for young people around the globe, helping students develop imaginative thinking, creativity, curiosity, a positive self-image, and a respect for their own and others' cultural heritage. In addition to hosting an annual International Jazz Competition since 1987, the Institute also helped, through its partnership with UNESCO, designate April 30, 2012, as the first annual International Jazz Day. Monk was inducted into the North Carolina Music Hall of Fame in 2009. ^ Yanow, Scott. "Thelonious Monk". AllMusic.com. Retrieved March 31, 2012. ^ "Thelonious Monk (American musician)". Encyclopædia Britannica. Retrieved March 31, 2012. ^ Robin Kelley (2010). Thelonious Monk: The Life and Times of American Original. London: JR Books. p. 1. The source identifies the day of Monk's fortieth birthday in 1957. ^ Giddins, Gary; DeVeaux, Scott (2009). Jazz. New York: W.W. Norton. ISBN 978-0-393-06861-0. ^ a b c d e f Graham, David A. (October 18, 2017). "Thelonious Monk's Quiet, Slow Conquest of the World". The Atlantic. Archived from the original on May 18, 2018. ^ Time cover, February 28, 1964. Retrieved December 22, 2010. ^ 1&Ntt=jazz&x=23&y=10 Search of Time covers for "jazz". Retrieved December 22, 2010. ^ Solis, Gabriel (2007). Monk's Music: Thelonious Monk and Jazz History in the Making. University of California Press. pp. 19–20. ISBN 9780520940963. ^ Mathieson, Kenny (2012). Giant Steps: Bebop and the Creators of Modern Jazz, 1945–65. Canongate Books. p. 127. ISBN 9780857866172. ^ Robin Kelley (2009). Thelonious Monk: The Life and Times of an American Original. Free Press. pp. 13, 31. ISBN 978-0-684-83190-9. Retrieved November 23, 2013. ^ a b Bliek, Rob van der (February 22, 2001). The Thelonious Monk Reader. Oxford University Press. ISBN 9780199761470. ^ a b Gordon, Lorraine (2006). Alive at the Village Vanguard: My Life in and Out of Jazz Time. Hal Leonard Corporation. pp. 63–65. ISBN 978-1-61774-916-2. ^ Miles: The Autobiography with Quincy Troupe. p. 80. ^ a b "Looking At The Life And Times Of Thelonious Monk", transcript of interview with Robin D.G. Kelley by Terry Gross on Fresh Air, NPR; conducted in 2009, replayed December 17, 2010. Retrieved 2010-12-22. ^ State v. De Koenigswarter, 177 A.2d 344 (Del. Super. 1962). ^ Marmorstein, Gary. The Label The Story of Columbia Records. New York: Thunder's Mouth, 2007, pp. 314–315. ^ Monk, Thelonious. Monk's Dream. Columbia reissue CK 63536, 2002. Liner notes, p. 8. ^ Gabbard, Krin (February 28, 1964). "The Loneliest Monk". Time. 83 (9). Retrieved November 12, 2007. ^ Voce, Steve (August 1, 2005). "Obituary: Al McKibbon". The Independent. Findarticles.com. Archived from the original on March 11, 2007. Retrieved November 12, 2007. ^ Porter, Lewis (1998). John Coltrane: His Life and Music. University of Michigan Press. p. 109. ISBN 0-472-10161-7. ^ "Art Blakey: Bu's Delights and Laments," by John B Litweiler in Downbeat magazine, March 25, 1976. ^ a b Gabbard, Krin (Autumn 1999). "Evidence: Monk as Documentary Subject". Black Music Research Journal. Center for Black Music Research — Columbia College Chicago. 19 (2): 207–225. doi:10.2307/779343. JSTOR 779343. ^ Spence, Sean A (October 24, 1998). "Thelonious Monk: His Life and Music". British Medical Journal. BMJ Publishing Group. 317 (7166): 1162A. doi:10.1136/bmj.317.7166.1162a. PMC 1114134. PMID 9784478. ^ a b c d Owens 1996, p. 141. ^ Owens 1996, p. 142. ^ a b c Owens 1996, p. 143. ^ "Matthew Quayle: Introduction to the Round Midnight Variations". Web.archive.org. Archived from the original on July 14, 2011. Retrieved July 9, 2017. ^ "GRAMMY.com — Lifetime Achievement Award". Past Recipients. National Academy of Recording Arts and Sciences. Archived from the original on February 7, 2006. Retrieved November 12, 2007. ^ "The 2006 Pulitzer Prize winners: Special Awards and Citations". The Pulitzer Prize. Retrieved November 12, 2007. Owens, Thomas (1996). Bebop – The Music and Its Players. Oxford University Press. ISBN 978-0-19-510651-0. Wikimedia Commons has media related to Thelonious Monk.